AutoTURN has long been established as the prime solution for swept path calculations in the AEC sector. Architects, engineers and traffic planners rely heavily on the simple and user-friendly Transoft software to simulate vehicle swept paths with extremely high accuracy in a wide variety of contexts. From simple parking lots in private homes to the most complex roadmaps for heavy duty transports in rural areas, AutoTURN’s basic functions can deal easily with most situations that require the precise calculation of any given vehicle’s swept path. More often than not, the vehicles whose paths need to be simulated are standard passenger cars or HGVs. In particular, the needs of traffic planners are usually fully met when the simulations are based on such ‘normal’ cars and lorries only. Should a special vehicle be required whose dimensions fall squarely outside of the given norms, AutoTURN offers an easy-to-use function that allows one to create a vehicle of any size and shape for inclusion into the vehicle library. But AutoTURN can do even more. Sometimes the case in question is not unusual so much because the vehicle itself is differently built than standard cars, but because it has to carry something with proportions that are somewhat out of the ordinary. Such cases include, for example, snow ploughs in front of service vehicles; comma or massive windblades that outsize the surface they lie on during transport. 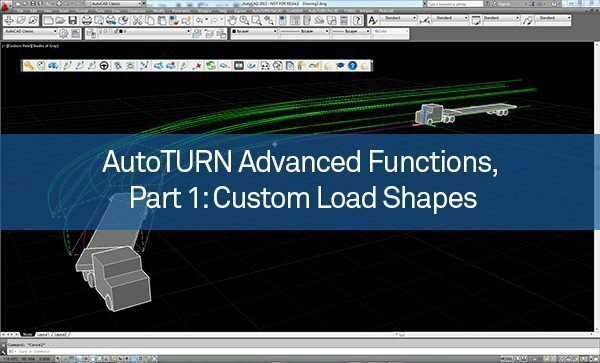 For such purposes, AutoTURN has devised the ‘custom load shapes’ function that allows for the easy inclusion of an unlimited number of custom loads at any vehicle part. Users can draw complex load shapes in their preferred CAD environment and assign it to any part of the desired vehicle. Once a datum point has been picked for the load shape, front distance, side distance and rotation angle can be freely defined. stands in as a model for non-physical entities. In this sense it can, for example, be used to simulate a crane’s reach area. With AutoTURN’s custom shape tool, an engineer planning site access for a crane could thus make sure that the required reach at a certain elevation height is met by assigning a load shape in 2D as a concentric circle. On the AutoTURN ribbon / menu bar, choose Vehicles to access AutoTURN’s extensive vehicle libraries. Choose the vehicle you would like to assign a load shape to. View the Vehicle Details of that vehicle. Click on Define 2D loads to assign load shapes. Choose the vehicle part you would like to assign a load to. Click “Import 2D Load” to assign a custom drawn load shape. Pick a polyline from the drawing and a datum point. If applied creatively, the custom shape function opens up a whole new range of possible usages for AutoTURN.